Thanks to Elle Magazine's March 2015 issue, we now have a (slightly blurry) look at the upcoming movie. We've blown the teeny tiny photograph up for everyone revealing Jem's new less-shag/more-straight hairdo (hmmm), a keytar and absolutely gigantic Jem-like guitars. We're not sure, but it seems like Jem is saving the traditional pink dress for another occasion, but at least the sash remains intact. Also, her pink makeup looks a lot more extreme than in the cartoon, but that could just be this image. It all feels very "yep that's good enough." But then again we haven't seen her earrings, shut up they're important. We've had some serious concerns regarding the live action Jem and the Holograms movie. The whole thing was seemingly written, cast, and shot in a matter of minutes. The new plot changed Jerrica Benton from a music company owner into an orphan who "becomes an online recording sensation, and she and her sisters embark on a music-driven scavenger hunt — one that sends them on an adventure across Los Angeles — in an attempt to unlock a final message left by her father." Oh, and the creator, Christy Marx, was never consulted in the making of this film. Just rewriting all that bums me out to no end. But on the bright side, Juliette Lewis and Molly Ringwald were added to the cast (we're seriously hoping Lewis will bring the rocker cred and stage presence). Plus, the actress playing Jem (Aubrey Peeples from Nashville) has a serious set of pipes on her, so fingers crossed she gets to belt out her own songs. Here's the full magazine article, which was really just a teeny tiny blurb. 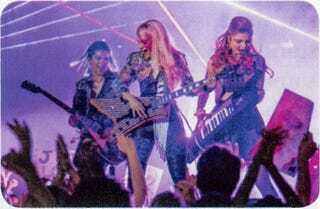 Looks like Jem with Aja on the bass and Kimber on the keytar. Shana appears to be absent (presumably on the drums and just out of sight) but we've seen glimpses of each cast member in a previously released studio photo, even though it really only showcased the girls' hair. Honestly, it's too blurry (and cleverly hidden) to cast too much judgement on the level of outrageousness yet. Also, let's get real: the Misfits are the most important part of this whole damn thing. Get that wrong too, and we're done. Meanwhile the Jem reboot that is continuously killing it with their amazing and fresh reinterpretations of these amazing characters is the Jem comic from IDW. And now the writer and artist for the comic (Kelly Thompson and artist Ross Campbell, respectively) just released this big character reveal — Kimber and Stormer are a couple! In an interview with AdvocateSpotlight, Campbell confirmed the status of Kimber and Stormer's relationship (they're together!!!) and Thompson elaborated. Thompson: We are definitely having LGBTA+ characters. Jem was always really diverse, but it was of course a bit limited by the time period and by being a children's cartoon. It's only natural that a modern Jem includes additional diversity. Kimber and Stormer are indeed both out gay characters in the comic and as Tumblr will very excitedly let you know, we're going to be exploring a romantic relationship between the two characters. We have some other plans for LGBTA+ characters as well but it's still early days and we're still figuring out how some things can fit together to tell the best possible story. Seriously, this Jem comic keeps getting more and more interesting. Oh, and it's gorgeous. Fingers crossed the movie can compete.